LEXINGTON, S.C. - Authorities say a South Carolina man will be charged with murder in the deaths of his five children after he led officials to a secluded clearing in Alabama where their bodies were found wrapped in garbage bags and confessed to killing them. Acting Sheriff Lewis McCarty of Lexington County, S.C. said Wednesday at a news conference that Timothy Ray Jones Jr., 32, would be charged with five counts of murder when he arrives in South Carolina. Jones is currently being held in Mississippi. 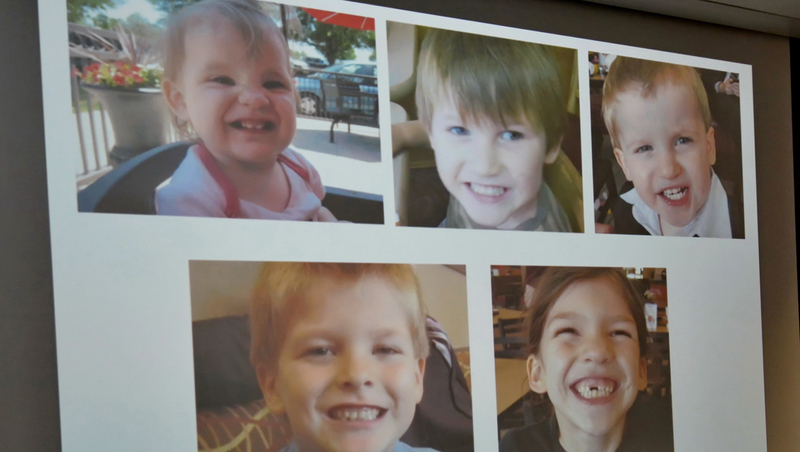 McCarty says authorities believe that Jones killed the five children at the same time, but he did not say specifically why he thought that. He says authorities are not sure of the motive for the killings. McCarty says autopsies are scheduled to begin Thursday. He says he's unsure when they will be finished, and officials won't comment on any causes of death or release the children's names until then. McCarty says the children's mother, Jones' ex-wife, is in shock and distraught. The children were ages 1 to 8. Jones is suspected of having killed the children in South Carolina before wrapping their bodies in garbage bags, placing them in the trunk and driving to Alabama - a trip that is expected to have taken several days, according to McCarty. When the children's bodies were found Tuesday, they were in an advanced stage of decomposition, the sheriff said. The 32-year-old was detained in Smith County, Mississippi, on Saturday after being stopped at a motor vehicle checkpoint near Raleigh, Mississippi, and charged with drunken driving. McCarty said Wednesday Jones was arrested after authorities found chemicals used to manufacture methamphetamine and a substance believed to be the street drug Spice, a form of synthetic marijuana, in his car. Cleaning materials and blood were also spotted in the car, according to the sheriff. "He seemed very strange, maybe somewhat disoriented and a little bit on the violent side," McCarty said of Jones' behavior during the traffic stop. "[The officers] saw blood. They saw children's clothes, but no children," he continued. During a background check, police discovered that Jones was wanted in South Carolina "regarding a welfare concern of his children," who were on a national missing persons list. The children had been reported missing by their mother Sept. 3, according to authorities. Authorities did not issue an Amber Alert because the case didn't meet the criteria - Jones had legal custody of the children, State Law Enforcement Division Chief Mark Keel said. It wasn't until late Monday when authorities say Jones confessed to deputies that he had killed his children and dumped their bodies. He led them to the location of the bodies on Tuesday. Officials would not immediately comment on whether there had been previous reports of domestic violence or criminal activity relating to the family. They said they planned to release more information regarding that subject later Wednesday. Johnny Hyder, a former neighbor of the Joneses in Batesburg-Leesville, South Carolina, told the Assocated Press said that when the Joneses lived next door, the children were often dressed in dirty clothes and were seen home at all hours of the day because Tim Jones had said he didn't believe in the public schools. Hyder said Jones was constantly looking for a reason to argue and often threatened to call the police. He said Jones approached him with a gun on his hip one day and was angry about something, but Hyder couldn't remember what it was. When Hyder said he was going to call police, he said Jones told him it was only a BB gun. "It wasn't a BB gun," Hyder said. "It was a real gun. I know what one looks like, but I didn't want to cause any more trouble." Johnny Hyder's wife, Marlene, said Jones threatened to kill one of their dogs when it briefly went onto his property. "He was a nut," she said. Marlene Hyder said she also remembered a day when one of the Joneses' younger children came over to the Hyders' house and tried to drink out of one of their outdoor spigots. He was dirty and disheveled and ran back to his house when she tried to speak to him, she said. Authorities said Jones, who they described as a computer engineer, has no history of mental illness. Jones currently resides in a mobile home south of Lexington. On Wednesday, food and other garbage were piled up outside his door. The yard was overgrown, with broken toys strewn about. A sign on the front door said, "Is there life after death? Trespass here and find out" with a photo of a gun. Sheriff McCarty said Monday that the case has certainly left a mark on him and other officials working the case. "I'm a father and I'm a grandfather and in all my years of law enforcement, I have never seen a case like this. It's hard to work a case with one child or one murder. It's very difficult to work two, but five is extremely hard," McCarty said.